In small bowl, mix 2 tablespoons of the lemon juice, 3 teaspoons of the garlic, the cumin, 1 teaspoon of the salt, 1/4 teaspoon of the turmeric and the cinnamon. Coat chicken in mixture; place in slow cooker with 1/2 cup of the broth. Cover; cook on Low heat setting 4 to 4 1/2 hours (or High heat setting 2 1/2 to 3 hours) or until chicken is very tender. Transfer chicken with slotted spoon to cutting board; shred and reserve. Discard cooking liquid. Meanwhile, in 2-quart saucepan, heat oil over medium heat. Stir in rice and remaining 1/4 teaspoon turmeric; cook 1 minute, stirring constantly. Add remaining 1 3/4 cups broth; heat to simmering. Cover; reduce heat, and simmer 18 to 20 minutes or until liquid is absorbed. Let stand 5 minutes covered; fluff with fork. In small bowl, mix yogurt, remaining 1 tablespoon lemon juice, remaining 1/2 teaspoon garlic and remaining 1/2 teaspoon salt. 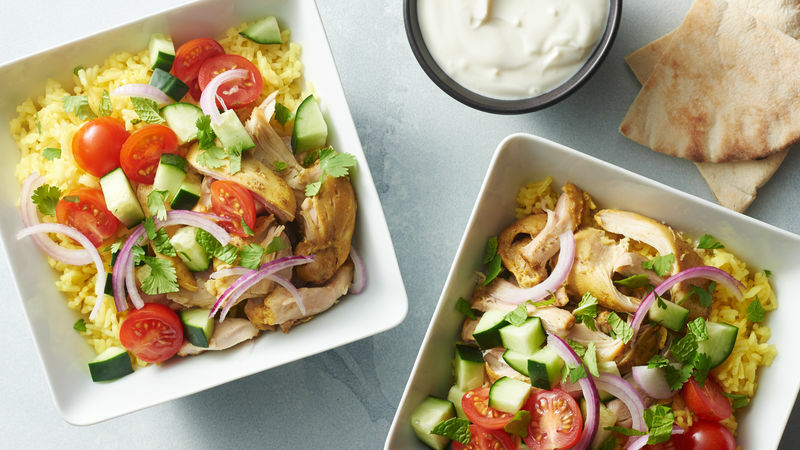 Divide rice among serving bowls; top with chicken, tomatoes, cucumber, red onion, fresh herbs and pita. Serve with yogurt sauce. Shawarma is defined as roasted meat, typically lamb, chicken, turkey or beef. Shawarma is traditionally seasoned with cumin, cinnamon, turmeric and shaved and served in a pita with fresh toppings. Turmeric is a root vegetable related to ginger and is grown in India, Asia and Central America. It has a bright yellow color and is popular in dishes from those countries. Coating the rice in oil and cooking briefly toasts the individual grains and helps with liquid absorption, resulting in the perfect rice texture.